"Is this the artifact of a real person or not? Definitely it is," Ray Downing, the digital illustrator at the center of the show, told me today. Downing worked with specialists on the shroud to come up with a photorealistic representation of the man whose body's imprint appears faintly on a famous 14-foot-long length of linen. For some Christians, the stain serves as the miraculous snapshot of their risen Lord. For most scientists, it is a cleverly done fake from the 13th or 14th century, but nothing more. Back in 1988, carbon-14 dating tests were conducted on a sample from the shroud in an effort to determine whether the cloth was created in Jesus' time. The verdict from three laboratories was that the cloth was produced in medieval times. But the shroud's fans have insisted that the sample was actually taken from a patch, rather than from the original linen. Just this month, a chemist proposed a new series of non-destructive dating tests that would give an estimate for the entire cloth. From a marketing perspective, the timing of the History Channel show couldn't be better: Good Friday and Easter Sunday, the Christian holy days that mark Jesus' death and resurrection, are just a few days away. What's more, the shroud is due to go on display for six weeks at Turin Cathedral, starting April 10. The last time the relic was exhibited, a decade ago, more than 3 million people came to Turin to see it. More than a million reservations have been received already for next month's viewing. Have scientists been wrong about the shroud? Downing noted that historical records referring to the shroud predate the current carbon-14 estimate. "We know the carbon-14 [test] is wrong," he said. "The question is, how wrong are they? The further back you go, the less likely it is that anybody could have faked it." But the dating debate isn't the focus of Downing's work: Rather, he concentrated on what the shroud shows. Could the faint outlines preserved in the cloth match up with the outlines of a specific person? Downing found that they could, and he drew up a 3-D image that fit the data. "It's just like how a police investigator will question an eyewitness, and from that information he can draw a complete sketch," Downing said. "The shroud is a silent witness. It's like the witness in an investigation." Downing started out with high-resolution photographs of the shroud from the Holy Shroud Guild and the Shroud of Turin Research Project. "Between the two of them we were able to come up with a good image," he said. He also consulted with John Jackson, a physicist who has come to specialize in studying the shroud at his research center in Colorado. 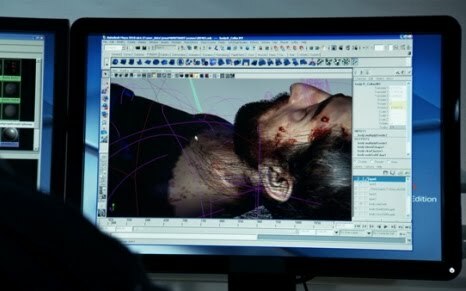 Once all the imagery was computerized, Downing used software to massage the 2-D data into 3-D imagery. 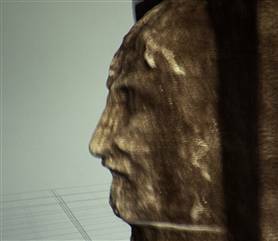 3-D visualizations of the face in the shroud have been done before, but Downing found that the data couldn't be matched up with a realistic representation if he just added another dimension to the shroud's flat plane. The image looked more like a reflection in a funhouse mirror - and that's because the cloth had to be draped around the body's form to produce a match. 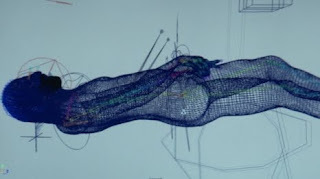 Downing said the cloth "encoded" the 3-D data on a 2-D surface. "It's as if there is an instruction set inside a picture for building a sculpture," he explained in a news release. By manipulating the computer model, Downing matched up the shroud's imprint with anatomical features drawn from more than 100 human scans. "The nose might have come from here, the nostrils from there," he told me. The result is a realistic illustration, based on the data encoded in the shroud. Downing said the depiction shown in the History Channel program represents his best effort to put flesh and bones on the shroud's imprint - and he would argue that it's the best effort anyone has made. "This is the closest one, anatomically," he said. Over the years, not everyone has agreed that the shroud can fit a realistic form. Joe Nickell, a paranormal investigator for Skeptical Inquirer magazine, told an interviewer a decade ago that if the draping effect is taken into account, the body beneath the shroud would have to have been "unusually narrow ... so very long and narrow that one pro-Shroud pathologist suggested that Jesus must have had Marfan's syndrome." If Downing's analysis played it straight, the shape beneath the shroud is at least plausibly human. But is it Jesus? Or some anonymous person from the first or the 13th century? Feel free to weigh in with your comments below, before or after the show airs. Update for 8:18 p.m. ET: In a follow-up telephone interview, Skeptical Inquirer's Joe Nickell noted that questions have surrounded the Shroud of Turin since the 14th century, when it showed up in France. Nickell suggests that the shroud could have been forged by applying a red ochre pigment to the linen, then modeling it on a body with a bas-relief mask over the face. Nickell said an Italian chemist, Luigi Garlaschelli, used the recipe to create a shroudlike replica. "He made a 'shroud' using the theories of mine that I told you, then artificially aged it by baking, and then he washed it to remove the pigment - and voila! There was the yellow stain," Nickell said. The effect was similar to the effect seen on the Shroud of Turin. You can read more about Garlaschelli's experiment here and here. "There are two approaches to this," Nickell told me. "There's ordinary science, and then there's what I call shroud science. Ordinary science starts with evidence, and lets the evidence lead wherever it will. This is the approach used by a 'CSI' team. Shroud science is quite different, and it starts with the answer. They start by saying, 'This is the shroud of our Lord,' and then they take whatever steps they need to get to that answer." Nickell is skeptical ... not only about the Shroud of Turin, but also about the prospects for settling the shroud debate to everyone's satisfaction. "Shroud science is backward from ordinary science," he said. "It's very discouraging to me that the media have been so willing to give it a pass."